I get many questions about finish solutions for a newly installed product. Just today I fielded an inquiry about how to seal up and enhance the looks of a fire escape I installed earlier this year. 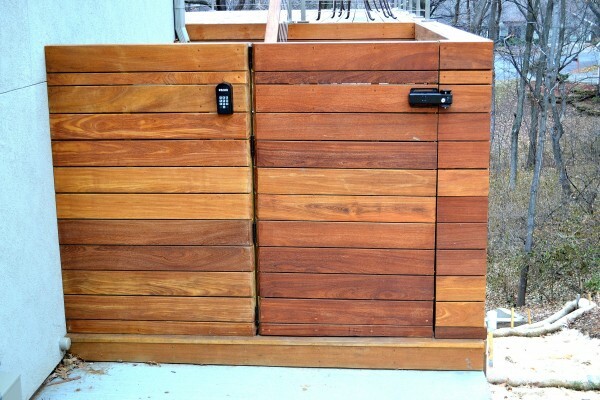 It was a bargain job, with Yellawood and a cedar railing system, but for the moment, it still looks sharp. The trick here, even with a relatively inexpensive product like treated lumber is to maximize the life of the product to ensure proper return on the investment. I’ve been out of the deck “building” game since the days of CCA. No money made on that thing, but I don’t want the owner feeling like the money hasn’t been properly spent either. Consultations were in order. I went to Sherwin Williams. There’s a fellow over at my local store that I worked with in college for a time. He’s spent eighteen years since selling paint and protectants, and I’m pretty sure he knows what he’s talking about. My inquiry, in this case, was to the effectiveness of the products he offered to bring some color to that treated lumber and simultaneously protect the integrity of the wood. He went over the basics, such as using an oil-based application with some tint. Even a little tint is better than an untinted application in terms of durability of the coating, because it assists in blocking the damaging rays of the sun. Photo courtesy of North Star Carpentry, Kansas City, Missouri. Cumaru with a clear finish. Yeah, sun…I’m calling you out. Sure, you heat the earth and provide it all possibilities necessary for life, but you’re also messing up these decks. So, please invest in a bit of tint if you want to preserve the coloration. Trading off a little darkening initially can best preserve the coloration of your hardwoods, if this is the look that is desired. Others want the natural coloration some of our hardwoods provide through the natural weathering process. Our customers who elect to naturally weather their hardwood installations aren’t making a bad choice at all. However, there will be a little loss of the effective life of the deck. If we’re talking about a thirty year product, giving up a year or so of life isn’t that big a deal when weighed against the increased maintenance of keeping the product more deeply colored. I consider end sealers to be non-negotiable when building any outdoor project with our tropical hardwoods. If you like nearly guaranteed splitting of an unacceptable portion of your lumber, feel free to skip sealing the ends. It’s time consuming, yes…but in most climates it simply has to be done. Perhaps in the future we could look more closely at the various end sealants, but the most important thing is to simply be neat about it, especially if the face surface is to naturally weather. There are sealants of all types heading this way as we speak. Some Messmer’s UV+ is on the way. I’m rounding up all kinds of products our customers have used through the years. We’ll test finishes starting this winter. I don’t know how much the artificial wear will enlighten me to the durability of these finishes. However, there needs to be a starting point, and this is one of the winter projects for Specialty Lumber Solutions. We’re getting to the bottom of this. At least as a representative of what can happen in Kansas winters when a guy chains up several sticks of wood to the back of his truck and drives around 40 acres.